On October 15th New Zealand cities joined the global “Occupy” movement which as of this writing is taking place in 1500 cities in over 100 countries as a protest against wealth inequality. 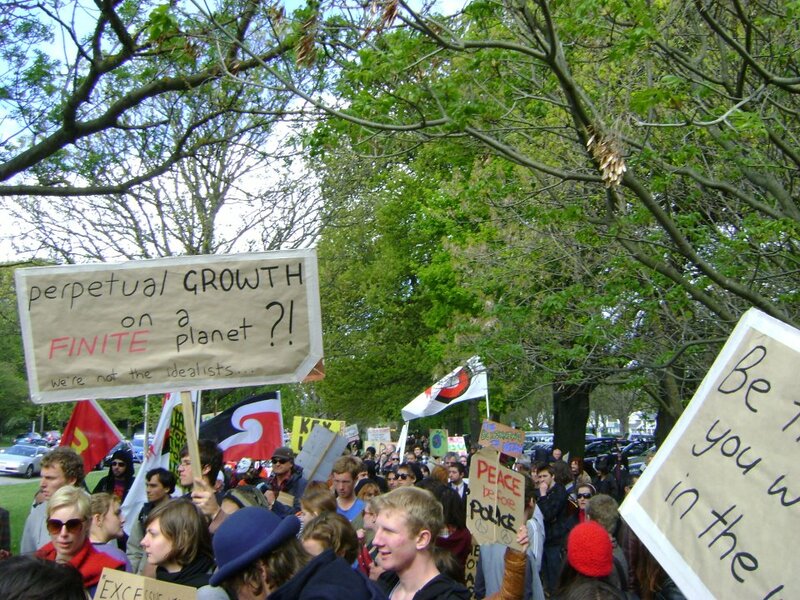 The December issue of The Spark will include further coverage of the movement; here we publish the statements issued by the occupations taking place in Auckland, Wellington, Christchurch and Dunedin. 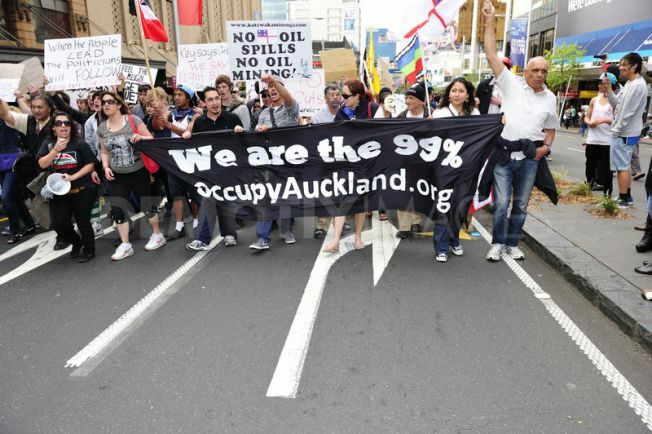 [Occupy] Auckland is a leaderless resistance movement with people of many colours, genders and political persuasions. We are the 99% and we believe in people and the planet before profit. We will no longer tolerate the greed and corruption of the 1%. We are also in solidarity with http://www.OccupyWallStreet.org , http://www.OccupyTogether.org and all of the Occupy movements around Aotearoa New Zealand and the world. We will be occupying Aotea Square from the 15th of October and encourage the use of nonviolence to maximise the safety of all participants. We recognise Aotea Square as Ngati Whatua land and that it is also a public space. Ngati Whatua have kindly consented to us ‘occupying’ this land. General Assemblies will be run to make group decisions and to build our movement. They are open, participatory and horizontal. This is the Wellington extension of the global movement that started with Occupy Wall St. We want a return to real democracy, a government by the people for the people & an economic system that works for 100% of the people. We stand in solidarity with the growing Occupy Wall Street movement, and other occupations taking place in over 1,500 cities around the world, including Auckland, Wellington and Dunedin. Our intention is to create a society of true equality. We are acting to educate ourselves and the wider community about pressing issues that face our world. The drive for profit has outstripped basic human and environmental needs, such as education, healthcare and the simplest of things like food and clean water. Excessive corporate influence has degraded our political system into governments composed of weak or corrupt representatives who support profit before people and planet. We intend to release statements in future which discuss local, national and global challenges, with these factors in mind. Our gratitude goes out to the lovely crowd who came to our opening rally on Saturday October 15th, the day called “United for Global Change”. Approximately 300 people peacefully marched down Riccarton Road in solidarity with our friends across the world, before returning to Occupation Corner for a great evening of music, dance and discussion. We would also like to thank the local authorities for recognising our peaceful intent and interacting with us in a friendly way. We hope that Christchurch recognises the importance of opening up channels of communication to help our city, our world and its people return to their feet. We make our decisions through consensus in daily General Assembly meetings at 10am and 8pm, where everyone is encouraged to speak in an open and welcoming setting. We encourage you to join us for a meeting and participate in an inspiring true democracy. During the day we hold discussion workshops and welcome passers-by to join us in thoughtful exchange. We respect the area where we have chosen to base ourselves, and we are doing everything we can to minimize our environmental impact. We clear the wider area of rubbish each day and regularly move our tents to protect the grass. We also seek to engage with local residents through daily activities in art, culture and sport. We are a safe and child-friendly occupation! Our diverse group includes people with a range of jobs, education, ages, family and friends just like you, and we are thoroughly enjoying engaging with a group of friendly and forward thinking people. 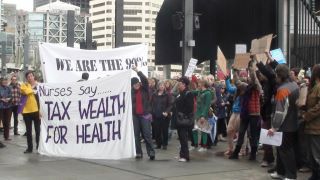 The time has come to show your support for injustices against the New Zealand people and the crimes of the Government! Let us unite and stand as one and show the world what we can do! We stand in solidarity with the Wall St Protesters and the many other protesters standing around the world that say 1% will not continue to steal from the 99%, which is happening right now. NZ is being stripped NOW! EMPOWER YOURSELF! You are the one you have been waiting for! There will be change. There will be justice! I hope they succeed. We need economic equality and the redistribution of wealth.